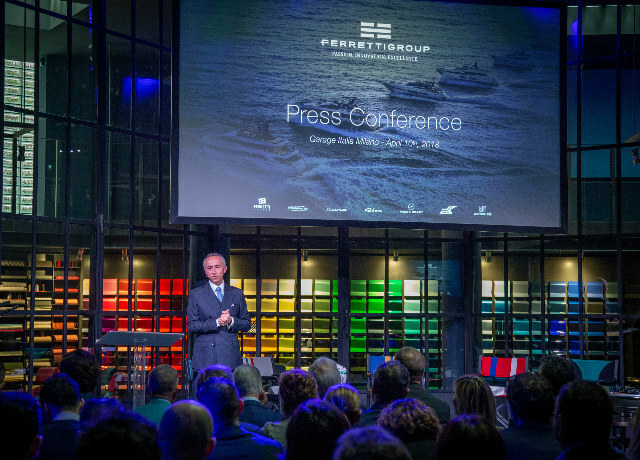 On Tuesday, April 10th, Ferretti Group presented the financial results of 2017, the outlook and the investments plan for 2018 in Milan at Garage Italia, at Riva Privée, expressively inaugurated for the occasion. The Group 2017 financial cycle registered a consolidated production value equal to 623 million euros, demonstrating 10.8% growth compared to 562 million euros in 2016. EBITDA grows by 11,3% compared to 2016 reaching 59 million euros. If 2016 marked the first year of net profit since 2008, passing from -29 million euros to +14.1 million euros, 2017 reconfirms the solidity of the Group, with the PAT (Profit After Taxes) equal to 24 million euros euro and a growth of 71%. Moreover, the Group’s total assets reached 971 million euros, of which 46 million composed of liquidity assets. The numbers prove it: thanks to the decisive support of the Weichai Group and Mr Piero Ferrari, the company has achieved a record profit this year, rose to 24 million euros. By decision of the shareholders, the cycle profit will be entirely reinvested in Research and Development on new models, which will be added to the 30 developed in recent years. The production capacity of the Group’s 6 shipyards and the workforce also grew, demonstrating that yachting, if managed at best, creates important job opportunities in Italy as well. 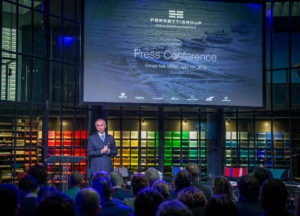 After completing the three-year plan with optimal performance and having fully regained the leadership of the sector, Ferretti Group confirms the strategic direction already outlined and successfully pursued during the last four years: from 2015 to the end of 2018, 90.8 million euros have been invested and allocated to new investments in R&D and in new products development, for a total of 30 new models, of which 8 only in 2018. The outlook for 2018 foresees a production value of 704 million euros. The 2018 project also includes a recruitment plan of 80 people in all the shipyards, located in Lombardy, Liguria, Emilia Romagna and Marche. The recruitment will focus in particular on the Ancona shipyard, dedicated to the construction of the large steel and aluminium boats CRN, Riva, Pershing, and the Custom Line fibreglass boats.